More Blast for Your Buck! 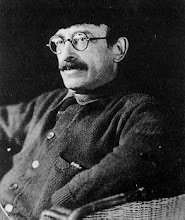 The Alexander Berkman Social Club is a group of anarchists who want to talk about what anarchism is, how anarchists see things and what anarchy could look like. Named after the editor of San Francisco’s mighty The Blast, we hope to have continual monthly meetings that are open to all. If you come you’ll get a membership card, the chance to win thousands of dollars (alright – the odd book or two) and hopefully something to think about and act on. You failed the audition for “So You Think You Can Dance,” and you just don’t seem with it. Don’t worry. The ABSC will have you. See you there! All of our meetings are held at 7pm on the last Thursday of the month at 522 Valencia St. (between 16th & 17th St.) in San Francisco. Visit us on Facebook and Myspace. Tom Wetzel on the past and present of anarchist workers struggles against capitalism. Have you missed a recent meeting? Curious about what was discussed? Feel like you're missing out? Want to more about a topic or the awesome speakers? Reports of prior meetings or a little more about the ABSC? Well yes we do eventually try to publish pictures and audio of the events, but now we also have programs for the events. Oh the excitement!